The end of this month brings about the return of the annual EurekaSprings.com Christmas Festival. Experience a holiday like no other by spending time in an authentic Victorian mountain village. Every year, Eureka Springs sets out to make each holiday season better than the last! This year, The Eurekasprings.com Christmas Festival runs November 28th – December 14th. Shop in one of many independently owned stores, tour beautiful Victorian homes, snap a photo with Santa in Basin Spring Park and more! Start planning your Holiday Getaway now! Below are a few highlights of our festival. For more information on this great event, visit the Official EurekaSprings.com Christmas Festival page! Experience the Light at the Great Passion Play! From November 28-December 20th, the Great Passion Play celebrates Christmas and the birth of Christ from 6:00 PM to 8:30 PM. Be sure to make this part of your Christmas getaway. 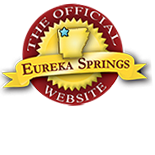 Visit EurekaSprings.com’s Calendar of Events for updated information and event times. Spend a couple of days in Eureka Springs. Find Eureka Springs Lodging and more. This entry was posted on December 18, 2014 by service424 in Festivals, Fun Downtown and tagged christmas, Christmas Festival, holiday getaway, homes, victorian tour.